"Like the energy of the distant Sun your sakti falls on me and removes my sorrow." THE advent of Jesus was heralded when a star arose in the sky showing the wise men the way to the place where he was born. Historically, the light of knowledge arose in the East and shone in the Western world. Bhagavan Sri Ramana's message was passed on to the West very early by Humphreys. The story of Humphreys itself was unusual. He arrived at Bombay in 1911 on being appointed as an Assistant Superintendent of Police, and within a short time of landing at Bombay fell sick. By then he already had practised yoga and was capable of travelling to any place in the subtle body leaving the gross one. Through his subtle body, Humphreys was able to find a Pandit (Munshi) at Vellore to teach him Telugu. On March 18, the Telugu Pandit, Sarvepalli Narasimham (later, Swami Pranavanada) came to him. came, he asked him if there were any Mahatmas in the vicinity and if he knew any such one. The Munshi probably thought that all talk of a guru to the Englishman was unwarranted and hence replied that he knew no Mahatma. The next day, the student said, "Munshi, you said yesterday that you did not know of any Mahatma but your guru appeared in my dream this morning. In fact, you were the first person of Vellore that I saw even at Bombay." The Munshi protested that he had never visited Bombay at all. Thereupon, the student told him of the occult powers acquired by him through the practice of yoga. The teacher was impressed and as requested by the student, showed him some pictures of great souls. On seeing Ganapati Muni's picture, Humphreys exclaimed, "This is the great man who appeared in my dream this morning. Is he not your guru?" Then the Munshi had to acknowledge that Ganapati Muni was indeed his guru. his struggle as a youth, his high ideals and his desire to help others were revealed. The Maharshi also spoke to him partly in English. Humphreys: Swami, can I do anything to reform the world? Maharshi: You reform yourself first. It is as good as reforming the world. not be able to do it? Maharshi: You do good to yourself first, after all you are also part of the world. Not only that, you are the world, the world is you. Both are not apart. Humphreys (after a pause): "Swami, will I not be able to perform any miracles like Krishna, Jesus and the like? Maharshi: Did those people think that they were performing miracles while doing those acts? Again after a pause Humphreys replied in the negative. Maharshi perhaps thought that interest in such powers would cause harm to Humphreys and warned him that the only thing to be obtained was the atma and that he should devote all his energies towards that end. He added that Humphreys should work towards the goal with an attitude of complete self-surrender. P.W.D. Supervisor, paid a visit to Bhagavan. He was tired and dust-laden; on seeing him, Bhagavan offered him some refreshments and quietened him. At that moment, the District Munsiff A.S. Krishnaswami Iyer was also there. With both Raghavachari and Krishnaswami acting as interpreters the conversation proceeded. Humphreys: Swami, I easily forget the lessons, only the last words remain in my memory. What should I do? Maharshi: You can attend to your duty as well as to your meditation. Humphreys had Bhagavan's darshan a third time. By then his regard for him had reached such a level that he considered it sacreligious to climb the hill with his shoes and hat on. So, he discarded them and reached the cave barefoot. Bhagavan while returning to the cave from somewhere saw Humphreys' belongings on the way and asked Palaniswami, who was with him, to pick them up. No one knew what instructions Bhagavan gave Humphreys on that occasion. Humphreys wrote a letter to his friend in England, detailing his visits to Bhagavan and the instructions he received. The friend, Felix Rudols, put it in the form of an article and got it published in the International Psychic Gazette. Later, that article was translated into several other languages and seekers of various lands benefited from the instructions of Bhagavan. Much later, the Englishman quit his job and became a monk of the Roman Catholic Church. Bhagavan's message abroad. This happened several decades ago and helped several seekers. Among such seekers, the first was Harry Dickman who belonged to Riga in Latvia, a country west of Russia along the Baltic Coast. Quite early in life he became interested in yoga and studied Hatha yoga, Raja yoga and practised certain asanas prescribed in the former. He had several students also who came to him to learn yoga. Dickman developed intense devotion and faith in Bhagavan and trusted him in everything. He also translated into his native language Upadesa saram and Who am I?. 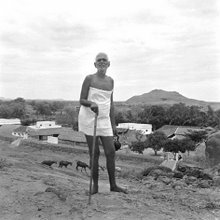 He would refer to Bhagavan the problems faced by him and his students in their practice of yoga and follow Bhagavan's instructions thereon. He had great faith in celibacy and respect for the Aryan Vedanta. He also believed that there was a close affinity in languages as well as knowledge between his country and India. He revealed that that part of his country where he lived was known as Kurujeemi i.e., Kurukshetra, in his language. In order to learn Aryan Vedanta first hand he learnt Sanskrit and English and also acquired some knowledge of Hindi. He made a thorough study of Vivekananda's collected works and lived in accordance with their teachings. Further, he sought to know the implications of the mahavakyas from Bhagavan. He also believed that in matters spiritual, advaita [?] was the last word. He and his disciples regularly celebrated Bhagavan's jayanti every year. Book reviewer for the journal "Forum" published from London, "Brunton" was a pen-name; his real name being Raphael Hurst. A Jew by birth, he was a British citizen. Right from his young days he had a religious bent of mind. In order to acquire esoteric skills he became a member of the Theosophical Society and though he spent two years there he was not satisfied. Believing that in the Eastern countries many people specialized in secret skills he visited some sadhus, and fakirs and wrote a book A Search in Secret India on his experiences. In that book he praised Bhagavan saying that among all those he visited, Bhagavan was unequalled and that he considered Bhagavan to be his guru. Well-written as it was, the book soon became popular and many westerners turned towards Bhagavan. In that book Brunton gave his experiences at Arunachala in detail. Brunton on his visit to Bhagavan prostrated himself and sat in front of Bhagavan, who had a peaceful, serene look. Brunton imagined at first that those looks were meant to impress devotees but soon that suspicion was removed. and wisdom were due to Bhagavan's grace. He wondered if the Maharshi "emanated the perfume of spiritual peace as a flower emanates fragrance from its petals." But this peace did not last long. It vanished after a little while and the mind reverted to its habitual unrest. He later said of the Maharshi, by frequently visiting this sun of wisdom the darkness of ignorance cannot but vanish I also noticed that in his silent moments he took me into his world of peace. The fact that Bhagavan's mouna [?] was more powerful than his speech became evident at such moments. Behind his undisturbed mouna [?] there was a tremendous power. By this power he could enslave others without uttering a single word or lifting a little finger. He was utterly simple, his lofty grandeur was visible in his presence. He never exhibited his occult powers to impress others. He deprecated all attempts to worship him as a deity and resented all kinds of exhibitionism. We cannot but accept that such a Mahatma has come to dispense knowledge to us and not to indulge in futile argumentation. The Maharshi's method which did not rest on any miracles or blind superstition, his example which could be followed and his outlook have greatly impressed me. I greatly appreciate the Maharshi's spiritual sublimity and his absolutely scientific self-enquiry path. In this path there is no mention of `God' at all. He puts forward a way of self-analysis which can be practised irrespective of any ancient or modern theories or beliefs which one may hold, a way that will finally lead man to true self understanding. Though the Maharshi remains in mouna [? ], in this practice the sadhaka feels that some power emanates from him to help the sadhaka. Maharshi's eyes glow like twin stars through the half- darkness. I remind myself that never have I met in any man eyes as remarkable as those of this last descendant of India's Rishis. Insofar as the human eyes can mirror divine power, it is a fact that the sage's do that. An Englishman and an Oxonian, his earlier name was Frederick Fletcher. He mastered several European languages and was a commander of the armed forces during the world war. The immense destruction and loss of life during the war touched him. He was repelled at the slaughter and like Emperor Asoka gave up a military career, became inward looking and embraced Buddhism and even became a Buddhist bhikku (monk). He travelled through Burma and Tibet moving about and living among Buddhist monks. He established an ashram, the English Ashram, at Rangoon (in Burma). Another devotee was Ms. Pascaline Mallet, a French lady, and author of `Turn Eastwards'. So was Joyce. H. Hidding. All these devotees wrote several articles and books on Ramana's philosophy. Mention must be made of Allen Wentworth Chadwick who also was a Major in the army and who also could not bear the violence of war and went looking for peace ? thus he turned towards philosophy. He roamed about all over and spent sometime in South America, meditating. Finally, hearing Bhagavan's story he reached Ramanasramam. He became a resident there. His dedication towards Bhagavan was boundless. Initially, he used to do girpradakshina but later he felt there was no difference between the hill and Bhagavan and commenced doing the pradakshina of the hall where Bhagavan sat. He worked for the publication of English books by the Ashram. of Bhagavan, some stayed back in India and propagated Bhagavan's teachings. Among them were Maurice Frydman, Cohen and Duncan Greenlees. Several German scholars heard of Bhagavan's message and were attracted to it. Dr. H. Zimmer, a Professor at the Heidelberg University, developed great interest in Bhagavan's teachings. He translated into German books such as Who am I? Ulladu Narpadu and Crumbs from the Master's Table. He later migrated to England and took up a job at the Oxford University during the period of turmoil which arose in Germany. Several books relating to Bhagavan were translated into French. In Switzerland, Ms. Olge Frobe Kepkyn, built an ashram to facilitate meditation at a beautiful tourist spot (Casa Garbrivella Ascona-Tessim) where Bhagavan's jayanti began to be celebrated. She always wished that someone from Ramanasramam should go there and act as a guru. But at Ramanasramam the objective was not propaganda. The Ashram felt that seekers should experience the Ultimate, something which each one had to do by himself and could not be done through lectures.